An oenophile is not safe from its scourge except in a nudist colony. The red wine stain, an inescapable consequence of the bibulous life, is a special hazard around holiday time, when liquid tends to flow freely and elbow room can be tight. So, I have gone to the mountaintop and consulted the highest authorities, a wine-country dry cleaner, a chemist and a veteran household-tips guru. What they had to say enlightened me. And I’d advise skipping the rest of this column at your wardrobe’s – or carpet’s – peril. 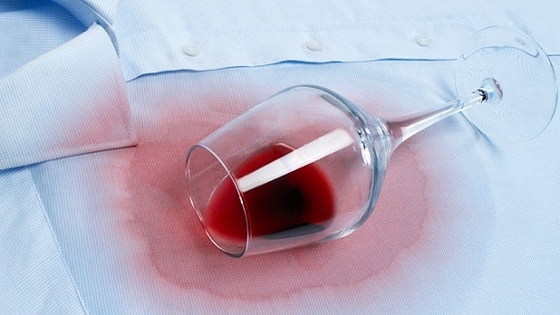 Frantic Lady Macbeth at-home stain-fighting strategies, including club soda, salt and – that bizarre old chestnut – pouring white wine over a red-wine stain, are not only ineffective but apparently can do more harm than good. A 2001 study conducted at the University of California at Davis, the leading wine school in the United States, dispensed with the latter two, among other things. Prof. Andrew Waterhouse, a wine chemist, teamed up with Natalie Ramirez, then a high-school student on a summer internship at the university, to compare various popular home and commercial remedies on red-wine stains. They divided the research into two sections: fabric that had been soiled just two minutes prior to treatment and dried-out fabric that had been stained for 24 hours. After each treatment – which typically involved blotting with the cleansing agent – the fabric was laundered with detergent in a home washing machine and the intensity of the residual stain was measured using a Minolta Colorimeter. The results, which cover four different types of fabric – cotton, polyester/cotton blend, nylon and silk – are too detailed to fully summarize in this column, but suffice it to say that the two most effective treatments on most fabrics consisted of: a mixture of Dawn liquid soap with an equal volume of hydrogen peroxide (a very mild bleach, specifically the 3-per-cent formulation commonly available as a wound treatment in drug stores); and Erado-Sol, a commercial cleaning solution traditionally used to remove biological and chemical stains from lab coats. (The latter is now sold to consumers as Stain Rx, available at stainrx.com.) Spray ’n Wash (now called Resolve) finished a respectable third only on the fresh, two-minute stains.